Kurstin has motivated all who come into contact with him to not lose use of their legs or arms. EAGLE POINT, OR—Though local man Bret Kurtsin has had to overcome many personal obstacles since having his legs amputated seven years ago, it has been said that his greatest achievement may lie in what he has given to others: the inspiration not to lose any limbs of their own. 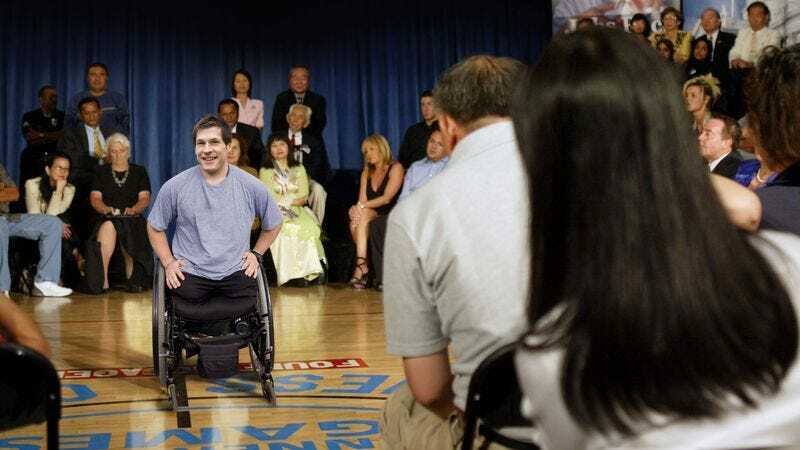 Many of those who have met him and heard his story credit Kurtsin, who became a double amputee after he was hit by a drunk driver at the age of 20, with motivating them to always retain the full use of both their arms and their legs. Several community members told reporters that the grueling hours of rehabilitation and physical therapy Kurtsin has endured shows a determination and resilience they hope never to have to summon from within themselves, saying the 27-year-old’s necessary resolve has further encouraged them to keep each of their four limbs intact. Others noted that Kurtsin has taught them a lot more than the simple value of never having both legs amputated a few inches above the knee. They said watching him has also inspired them not to have any part of a leg amputated, not to suffer an injury causing leg or arm paralysis, and not to be born with a congenital limb deformity that would in any way make it harder to move around and grab things. “If even one of my limbs were amputated, I’d probably just give up completely,” he added. According to teachers at Central Meridian High School, where Kurtsin spoke Wednesday, it wasn’t merely the double amputee’s story that resonated with the 200 students in attendance, but also his walk across the stage, for which he reportedly required the help of sophisticated prostheses. Kurtsin, meanwhile, said he is just glad he can make a difference in the lives of young people.